The detail is really well done, in my opinion. 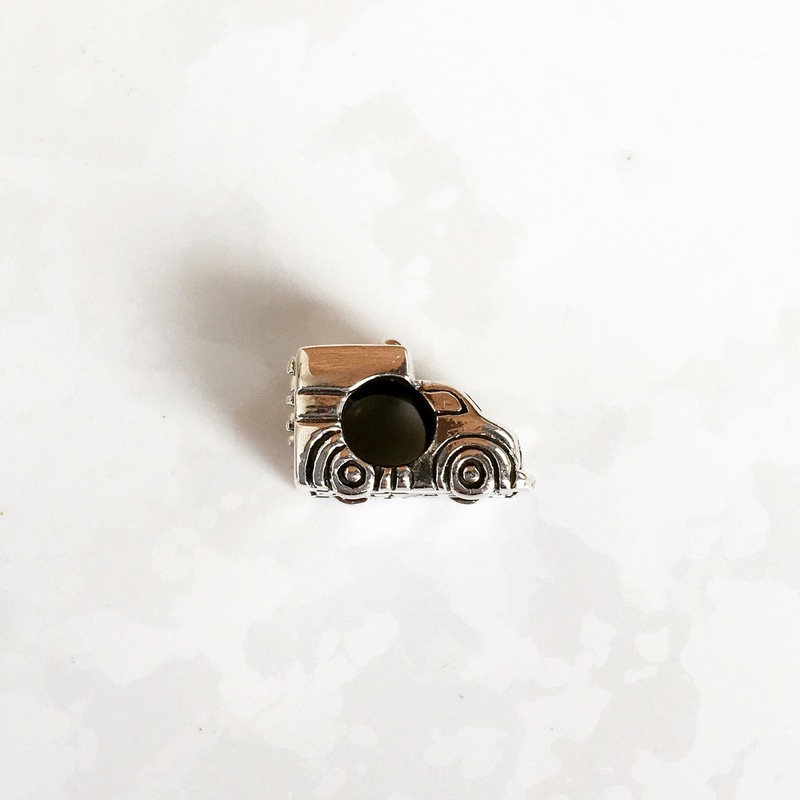 One of my kids has a gazillion little toy vehicles and he really likes this bead. I haven’t seen any photos on social media yet of the bottom of it and it’s amazing! The back of it has the Star of Life. Each bar represents one of six EMS functions: Detection, Reporting, Response, On-Scene Care, Care in Transit and Transfer to Definitive Care. I wanted to make a bangle using some of the new Animal Aptitude beads and added in some old Pandora striped beads. The locks are the Metal-ness ones. I thought they reminded me of treads on tires. The Rolled Over and Fire Hole barrel shaped glass beads would look awesome with the ambulance, in my opinion. Here’s my combo with a red leather bracelet added in. I hope these pictures were useful for anyone with a medical professional in their life that might like to have this bead. Remember to enter the giveaway from yesterday! 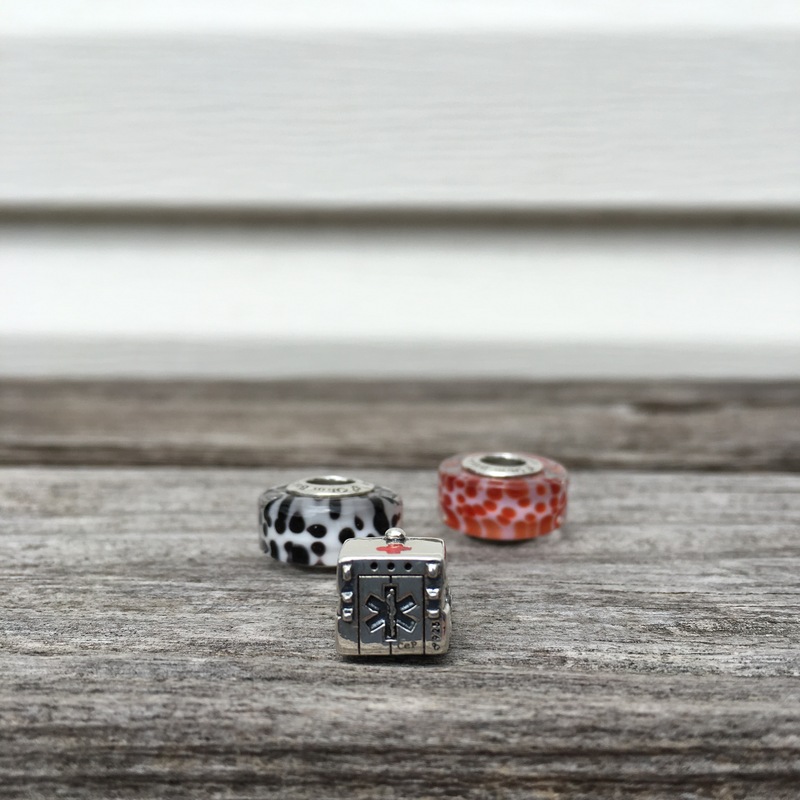 Previous Previous post: True Beadz Giveaway! Nice! I like how you captured the details from every angle. It’s not for me, but I can appreciate how much work went into designing this piece. Thanks for reading! Yes, it’s a niche piece that could be really special for someone. I almost gasped when I turned it over and saw the bottom! This charm will be welcomed by many customers! 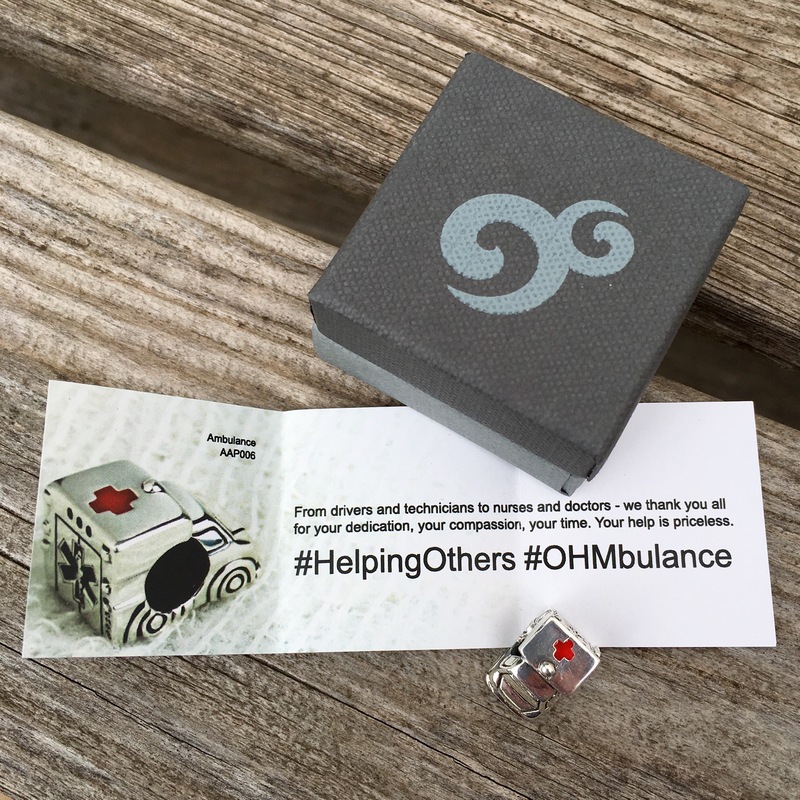 I will be sure to tell all of my customers who seek a charm to represent their profession, or family or friends, to go to Ohm website to order. Over the years, I have been asked countless times for just such a bead! 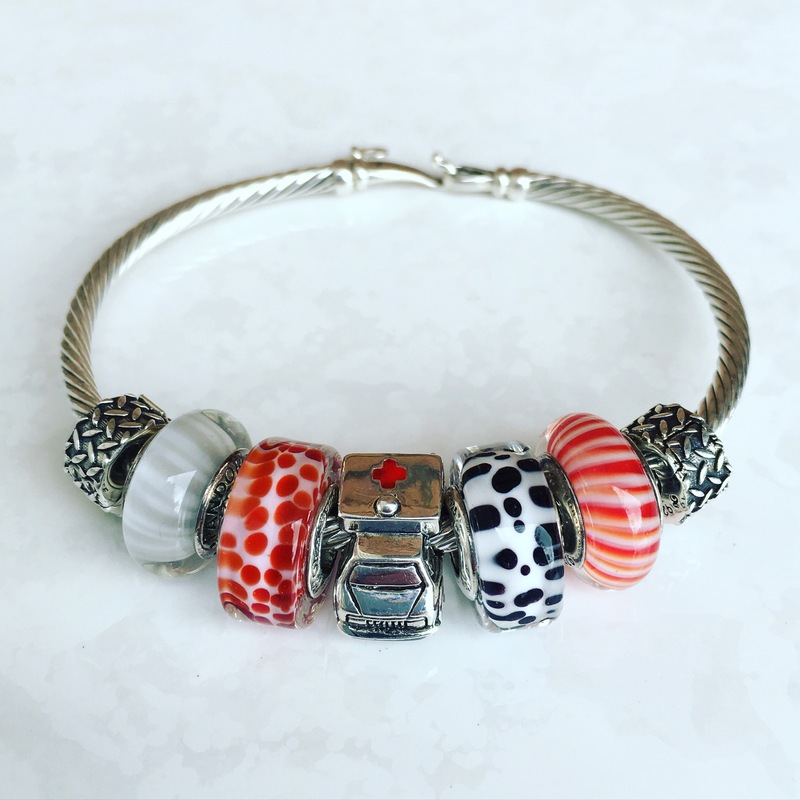 I love the way it fits perfectly with the other charms on your bracelet in the last photo! Thanks for spreading the word, Sarah! I think it would fit in really well with anyone’s collection. I’m going to do the bead mail chant for you again today! Thanks Martha! I have given up on that mail, honestly. Lol!!! When the bangle arrives we shall be #beadtwins. “This blog post is just full of information! 😉” I was going to say just that! I am a medical student and had no idea about the meaning behind the star of life, even though I know of the star and the six tasks of an EMT, I just never connected them 😛 I really like this bead, it’s so detailed and I am sure it will be super special for many. 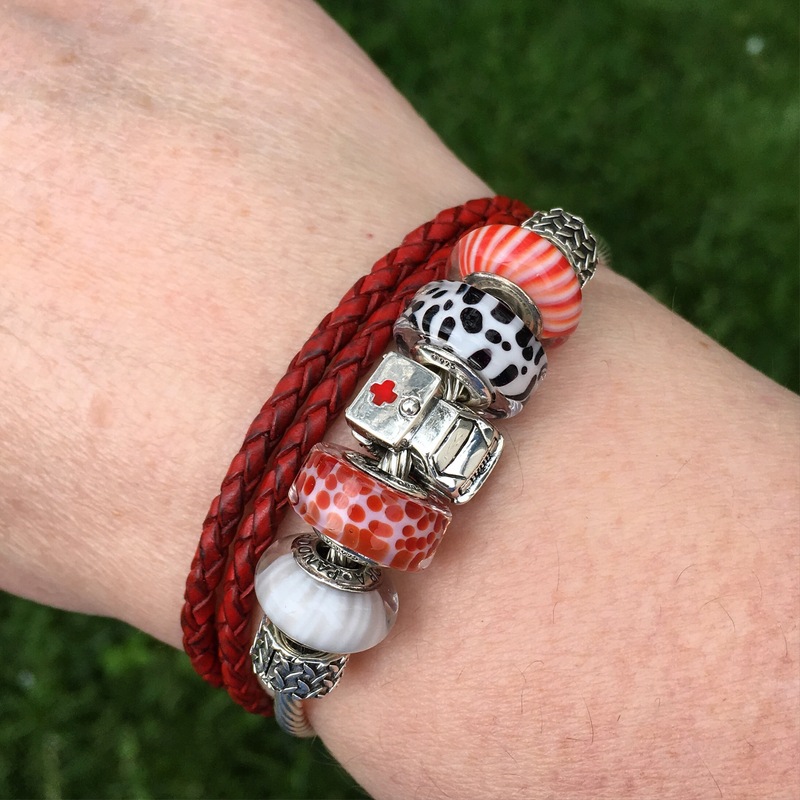 I myself want to purchase it when I am starting my clinical rotations in a few weeks, to go on my ‘doctor-to-be-bracelet’, or in this case ‘doctor-to-be-necklace’ as we’re not allowed any hand/wrist jewellery in the hospital ^^ I really enjoy your blog Martha, and you take beautiful pictures! Your blog is so dangerous!!!! But, I’m a risk taker, so I keep coming back! : ) I’ve purchased so many beads because of your beautiful pictures and jewelry combinations. I think your pics have spurred me to buy more beads than the advertising campaigns put out by the individual charm companies! I absolutely look forward to your blog daily, as it is so well done. Keep up the good work! You’ve got a new fan girl in the USA! Wow, thanks so much Emme! I’m glad you enjoy it! I love spreading the love of beads! 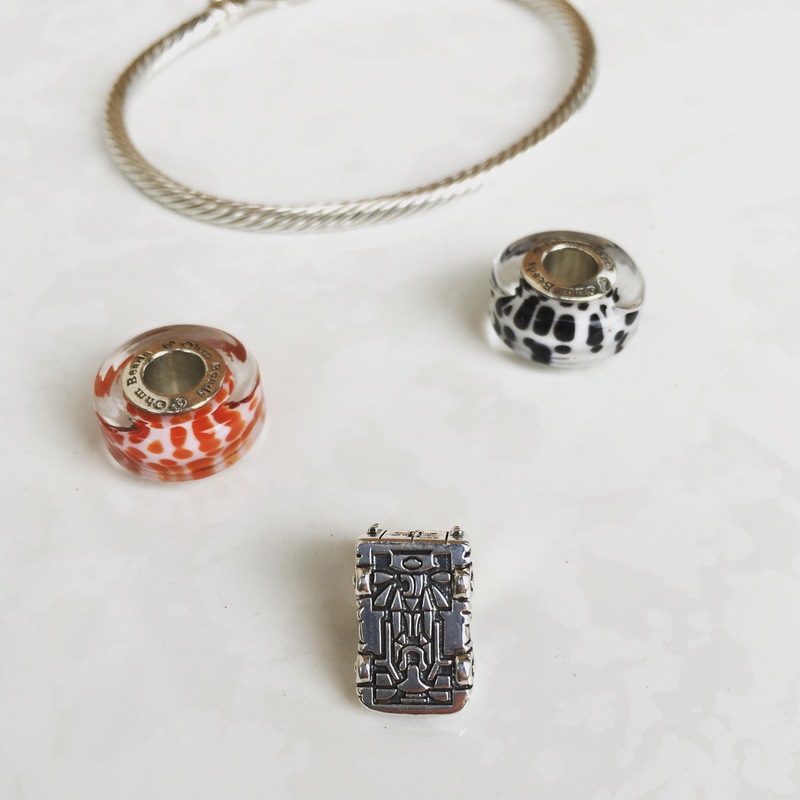 Not a bead to my personal taste but Ohm have done a beautiful design so I am sure a lot of collectors who are in the medical profession will adore it. Love how you’ve styled it. Thanks for commenting and reading, Debbie!